May 12, 2018 – Iranian regime supreme leader Ali Khamenei has time and again changed his position on the Iran nuclear deal. Now and then he would canvas the accord, formally known as the Joint Comprehensive Plan of Action (JCPOA), as a “making of various officials,” attempting to distance himself from any negative consequences. It is now known that all the while, Iranian nuclear negotiators enjoyed his blessing to become completely involved in talks with the “Great Satan,” read the United States. “I don’t trust these three countries either,” Khamenei added referring to the United Kingdom, France, and Germany. These contradictory remarks of seeking “true guarantees” while having no trust in the European Troika all signal the very grave crisis the Iranian regime is engulfed in. As a reminder, last year Khamenei boasted of torching the JCPOA and shredding it to pieces if the U.S. exited the accord. Now Khamenei and his regime are literally on their knees begging the Europeans. “It is now crystal clear that his second JCPOA will be very negative in comparison to the first round. Even if the negotiating team seeks guarantees from the Europeans, which [Khamenei] believes is unlikely, this second JCPOA will be nothing like the initial version,” according to the state-run Sharq daily. This means the Europeans will not be able to resolve anything for Iran’s regime. Khamenei understands this better than anyone. Having no other option is the reason he refuses to acknowledge this subject. At the end of the day, the Iranian regime must choose between the return of crippling sanctions and the pre-JCPOA circumstances under the UN Charter’s Chapter 7 conditions, or succumb to demands and enter new negotiations with bloodied knees. This will lead to further and increasing demands, targeting the very essence known as the Iranian regime. The Almighty God is in control in the Nations of Iran.. I speak God’s Glory in Iran…. Amen! May 9, 2018 – Following the United State’s decision to withdraw from the Iran nuclear deal and fully impose powerful economic against Tehran, there will be an increase in discussions on the path forward from here. If the Middle East is to experience anything resembling peace, democracy, stability, and security, it is an inarguable necessity to first realize democratic change and end the mullahs’ rule in Iran. Tehran has taken advantage of several decades of appeasement, resulting in the suffering of the Iranian people and nations across the region. The history of billions flowing into Iranian regime bank accounts and pallets of cash flown into this country must come to an end. Iran’s sinister regime, understanding no language but the language of a firm and definitive policy, is beginning to see the end of a long and fruitful journey at the expense of many others. Tehran, being the world’s central banker of international terrorism, “has funded its long reign of terror by plundering the wealth of its own people,” according to U.S. President Donald Trump’s speech. It is worth noting how the Iranian opposition coalition National Council of Resistance of Iran (NCRI), of which the People’s Mojahedin Organization of Iran (PMOI/MEK) is a member of, first blew the whistle back in 2002 on Iran’s clandestine nuclear program, highly suspicious of seeking nuclear weapons. Such an industrial scale effort is meaningless for a country sitting on an ocean of oil and natural gas. Especially when such a multi-billion dollar project is depriving millions of people struggling with poverty across the country. “Eradicating the clerical regime’s nuclear and terrorism threats means getting rid of the regime in its entirety. A regime based on the principle of Velayat-e faqih (absolute rule of the clergy) cannot exist without terrorism, suppression, and weapons of mass destruction,” said NCRIPresident Maryam Rajavi following the US decision. All banks and companies currently doing business with Iran are finding it extremely difficult to continue their endeavors. It is quite obvious that Iran’s $450 billion economy is no choice in the face of the U.S. $44 trillion economy. It is also a moral decision placed before everyone from all walks of life in the international community: to continue seeking short-term economic interests with Iran’s regime, or finally deciding to stand with the Iranian people in their quest for freedom, democracy, and human rights. Iran’s regime must also be stopped in its treks of warmongering, export of fundamentalism and terrorism, as explained by Mrs. Rajvi. It is quite interesting how standing alongside the Iranian people will actually further the long-term interests of the very parties currently appeasing the Iranian regime and only seeking short-term interests. Such a policy will also prevent Iran from launching a new war and bring an end to the ongoing wars already causing havoc across the region. The Iranian people proved once again in December and January how they seek liberation from the oppressive rulers sitting on the throne in Tehran. Democratic change is coming to Iran and each and every member of the international community must decide sooner or later where they stand on this very dire matter. As a necessity, the United Nations Security Council should take this opportunity and launch the global effort focusing on Iran’s long forgone human rights dossier, parallel to holding this regime accountable for its meddling throughout the Middle East and beyond, and advancing a dangerous ballistic missile program. Countless crimes have been committed by the Iranian regime inside the country and abroad. Steps are being taken against Tehran. More needs to be done and the Iranian regime must be held to the ropes until all those responsible for these crimes are placed before justice. NCRI – The North Korean intercontinental ballistic missile launch in the early hours of Wednesday morning sent shock waves across the world and many are now considering how best to deal with the threat posed by Kim Jong Un. After all the missile could have hit anywhere in the continental United States if it had been launched at a lower trajectory and US Defense Secretary James Mattis has revealed that the launch shows that North Korea could now hit “everywhere in the world, basically”. However, we could be overlooking a key element in this equation: Iran. Alan Dershowitz, a constitutional law scholar and political analyst, is considering how the US’s action on North Korea will impact on another rogue nuclear power in the near future. He said that the US cannot afford to make the same mistakes with Iran that it has with North Korea, because the ruthless ambition of the Iranian mullahs makes them far more dangerous. Indeed, each country has already had a failed (or failing) nuclear pact with the West which failed to contain their dangerous nuclear weapons programme. They have also collaborated on the North Korean nuclear programme and when the so-called sunset clauses run out in the current Iran nuclear deal, the Regime will already have the information to make a nuclear weapon, this highlights another way in which Iran is more dangerous than North Korea. If you wish to see Dershowitz’s interview, please click here. Freebeacon, June 5, 2017— Iran is believed to be developing advanced nuclear-related capabilities that could significantly reduce the time it needs to build a deliverable nuclear weapon, according to statements by Iranian officials that have fueled speculation among White House officials and nuclear experts that the landmark accord has heightened rather than reduced the Islamic Regime’s nuclear threat. The mass production of this equipment ‘would greatly expand Iran’s ability to sneak-out or breakout to nuclear weapons capability,’ according to nuclear verification experts who disclosed in a recent report that restrictions imposed by the Iran deal are failing to stop the Islamic Republic’s nuclear pursuits. Ali Akbar Salehi, the head of Iran’s Atomic Energy Organization, bragged in April that Tehran is prepared to mass-produce advanced centrifuges on ‘short notice.’ Work of this nature would greatly increase the amount of nuclear fissile material produced by Iran, prompting concerns the country could assemble a functional nuclear weapon without being detected. Salehi’s declaration highlights the ‘profound weaknesses in the JCPOA which include lack of inspector access, highly incomplete knowledge of Iran’s centrifuge manufacturing capabilities and output, and too few centrifuge components being accounted for and monitored,’ according to the report. Iran’s work on ‘any such plan is not included in Iran’s enrichment plan under the JCPOA,’ according to the report. ‘A key question is whether Iran is secretly making centrifuge rotor tubes and bellows at unknown locations, in violation of the JCPOA, and if it takes place, what the probability is that it goes without detection,’ the report concludes. Additionally, ‘the United States and the International Atomic Energy Agency (IAEA) need to determine the status of Iran’s centrifuge manufacturing capabilities, including the number of key centrifuge parts Iran has made and the amount of centrifuge equipment it has procured,’ the report states. When asked to address the issue, a State Department official told the Washington Free Beacon that Iran’s centrifuge work remains very ‘limited’ under the nuclear agreement. ‘The Trump administration has made clear that at least until this review is completed, we will adhere to the JCPOA and will ensure that Iran is held strictly accountable to its requirements,’ the official said. Ankara, Reuters, 25 May 2017 – Iran has built a third underground ballistic missile production factory and will keep developing its missile programme, the semi-official Fars news agency quoted a senior commander of the elite Revolutionary Guard as saying. “Iran’s third underground factory has been built by the Guards in recent years … We will continue to further develop our missile capabilities forcefully,” Fars quoted Amirali Hajizadeh, head of the Guard’s airspace division, as saying. Since taking office in January, Trump has imposed new sanctions on Iran in response to its recent missile launches, putting Tehran “on notice”. Iran has reacted defiantly. President Hassan Rouhani said on Monday: “Iran does not need the permission of the United States to conduct missile tests”. Iran’s Sunni Muslim Gulf neighbours and its arch-enemy Israel have expressed concerns over Tehran’s ballistic missile programme, seeing it as a threat to regional security. “It is natural that our enemies America and the Zionist regime (Israel) are angry with our missile programme because they want Iran to be in a weak position,” Hajizadeh said. Most nuclear-related sanctions on Iran were lifted last year after Tehran fulfilled commitments under a 2015 deal with major powers to scale back its nuclear programme – an agreement that Trump has frequently criticised as being too soft on Tehran. But Iran remains subject to a UN arms embargo and other restrictions. Iran says its missile programe is not in defiance with a UN resolution that calls on it to refrain from work on ballistic missiles designed to deliver nuclear weapons for up to eight years. “Along with improving our defence capabilities, we will continue our missile tests and missile production. 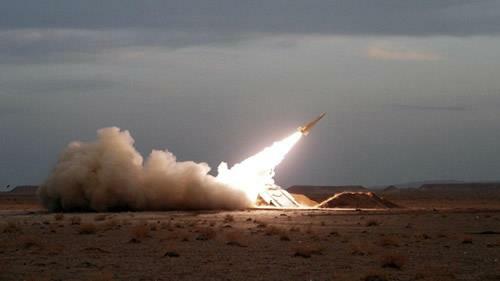 The next missile to be produced is a surface-to-surface missile,” said Hajizadeh, without elaborating. In retaliation for the new US sanctions over its ballistic missile programme, Iran this month added nine American individuals and companies to its own list of 15 US companies for alleged human rights violations and cooperation with Israel.